This resourceful and soul-warming recipe is from The River Cottage Meat Book (Hodder & Stoughton; £30). The stout replaces the need for a richly flavoured stock, something that many home cooks don't have to hand. It can also be finished with a layer of rough puff pastry and baked as a pie. Shin is sold as boneless medallions, which are easy to cube and perfect for any braise or stew that will get at least 2½ hours' cooking time. 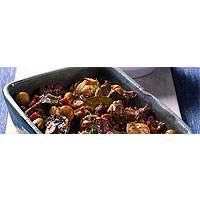 You can use diced stewing steak, from the neck or 'clod', as an alternative. Heat the butter in a large frying pan over a high heat and brown the pancetta. Transfer the pancetta to a casserole, leaving the fat behind. Gently fry the shallots in the fat until golden and add to the pancetta. Toss the beef in the flour with plenty of salt and pepper and brown it in the same pan in batches, transferring it to the casserole once coloured. Deglaze the pan with stout, scraping the residue into the casserole along with the remaining stout, so it covers the meat, adding water if necessary. Add the herbs and season. Bring to the boil, then reduce the heat to a very gentle simmer, with the lid on but not fully covering. Cook for 3 hours or until tender. After two hours, heat a little butter in a frying pan and sweat the mushrooms over a medium heat for 8-10 minutes, or until they have shrunk and the juices have run out. Add all this to the casserole and cook for the remaining time. Scatter with fresh thyme and serve with fluffy mashed potato.